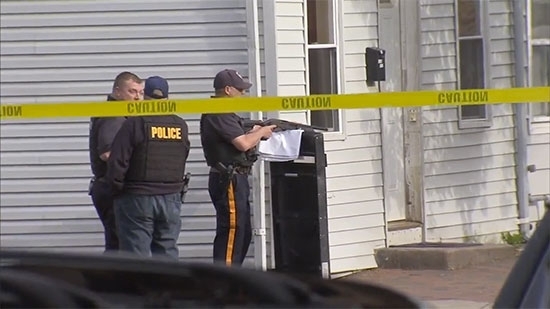 One person is dead and two officers have been injured after a man opened fire this morning in Trenton when U.S. Marshals attempted to serve a warrant. That man is now barricaded inside his home in a standoff with authorities. It started at 6:20 a.m. on the 300 block of Centre Street. Members of the U.S. Marshals NY/NJ Fugitive Task Force arrived and tried to serve a warrant but were met with gunfire when they entered the residence. As they backed out, two Mercer County Sheriff's Officers suffered minor injuries. They were taken to to Capital Health Regional Medical Center. A bystander on the street was shot and killed. The suspect retreated into his home. Streets have been blocked off and neighbors have been evacuated. Authorities are trying to negotiate with the man. UPDATE: 7pm. The standoff is still ongoing. Three officers were actually injured earlier. They have since been treated and released. 10:30 pm The suspect has been identified as 35-year-old Tyleeb Reese. The man killed has been identified as 56-year-old Robert Powell, Jr. of Lamberton Street in Trenton. UPDATE: 5/11 5:30 The standoff has ended. The man surrendered peacefully just after 5:00 pm. It lasted 35 hours. A man is under arrest for fleeing the scene after hitting and injuring a police officer while driving drunk in Kensington last night. It happened around 11:45 p.m. on the 3100 block of Custer Street. Bicycle officers first observed the 44-year-old man driving in his 2009 Ford Edge. When he got out of the car he was stumbling, unable to stand, and leaning on his vehicle. They approached him and tried to take his keys but he got back inside and put it in gear. The man drove the car up onto the curb and struck one of the officers. The 43-year-old officer's left leg was broken in two places. The driver then took off but was stopped by police nearby on Allegheny Ave. Chief Inspector Scott Small said that the man was clearly intoxicated and barely able to stand. An open container of alcohol was also found in the vehicle. He is facing probable DUI charges as well as aggravated assault and other charges. Prosecutors have put together a timeline of events at a Penn State University fraternity from February surrounding the death of a pledge. They used surveillance video from inside the Beta Theta Pi fraternity house, interviews with students, and text messages to compile the detailed timeline. 19-year-old Timothy Piazza died after drinking a dangerous amount of alcohol and falling numerous times including down a flight of stairs. Fraternity members did not seek emergency medical attention for nearly 12 hours after that fall and ignored signs that Piazza was in serious distress. Piazza suffered severe head trauma and a shattered spleen. He died of a traumatic brain injury. 8 fraternity brothers have been charged with involuntary manslaughter and 10 more face charges from furnishing alcohol to minors to evidence tampering. See the timeline of events below. About 9 p.m.: Fourteen pledges arrive at Beta Theta Pi for pledge acceptance ceremony. Pledges are led to basement and directed to drink from a vodka bottle. They run a gantlet of drinking stations, downing vodka, chugging beer and drinking from a wine bottle. They also play beer pong. By one estimate, they each consume four to five drinks in about 2 minutes. 9:43 p.m.: Timothy Piazza appears in security camera footage lined up with other pledges. His hand is on the right shoulder of the person in front of him. 9:58 p.m.: Piazza is seen drinking from a vodka bottle, then is handed a beer. 11:08 p.m.: Pledges show visible signs of intoxication as they return from the basement. 11:17 p.m.: Someone has to help Piazza walk to a couch. He gets up briefly and walks around before a fraternity brother puts him on the couch. 11:24 p.m.: Piazza is carried upstairs by four fraternity members. His body appears limp and his eyes are closed. A bruise appears on his left abdomen. He’s placed on the couch with others around him. A member appears to administer a sternum rub, but Piazza does not respond. 11:26 p.m.: Someone dumps liquid on Piazza’s face, but he does not respond. Another fraternity brother lifts Piazza’s arm, which appears limp. More liquid is poured on his face. A brother removes his shoes and tries to turn him on his side, causing Piazza to nearly fall off the couch. 11:32 p.m.: A brother attaches a backpack to Piazza so he won’t roll onto his back and choke on his own vomit. 11:37 p.m.: A brother sits at Piazza’s legs to prevent him from rolling over. 11:51 p.m.: A brother is shown on tape examining Piazza and making animated gestures. He later tells the grand jury he saw a bruise on Piazza’s chest and that he was thrashing and making weird movements. He stressed Piazza needed medical care, but another member shoved him into a wall and told him to leave. The brother confronts the chapter’s vice president, who also dismisses his concerns. 12:02 a.m.: The fraternity’s pledge master slaps Piazza three times in the face. 12:12 a.m.: One brother tackles another onto the couch, landing on top of Piazza, who remains unconscious. 1:37 a.m.: Piazza vomits. Three brothers again attach a backpack to Piazza’s back in an effort to keep him from rolling onto his back. 2:25 a.m.: Piazza rolls off the couch, onto the floor. Three brothers “slammed him onto the couch,” grand jury says. Minutes later a brother, seemingly frustrated, strikes Piazza in the abdomen with his open right hand. 3:53 a.m.: Piazza rolls to floor with the backpack still attached. His legs move. 3:59 a.m.: Piazza tries to get to his feet. The backpack comes off, but he falls backward and hits his head on the floor. Another member shakes him but then leaves. 4:23 a.m.: Piazza is on the floor in the fetal position. He’s on his knees and continues to grab his abdomen. Several minutes later he again tries to stand but falls facedown onto the wood floor. 5:36 a.m.: Piazza stands and staggers to lobby area, falls head-first into an iron railing and lands on a stone floor. He again tries to get up but falls head-first into the door. He spends about six minutes on his knees, with his head in his hands. He rolls to his side and clutches his abdomen. A forensic pathologist later estimates his blood-alcohol content at this point is between 0.19 and 0.24. 5:52 a.m.: A fraternity brother comes downstairs for a drink of water, steps over Piazza and leaves. 6:03 a.m.: Another brother comes downstairs for water, walks Piazza into the house’s “great hall.” Piazza falls down three steps and the brother leaves him on the floor. 7:34 a.m.: A fellow pledge videotapes Piazza before leaving the house. 7:55 a.m.: Piazza stands and staggers toward basement steps. Cameras do not capture what is assumed to be another fall. A forensic pathologist later estimates his blood-alcohol content is between 0.15 and 0.19 percent at this point. 10 a.m.: Two members see Piazza’s shoes and realize he must be in the house, so they search for him and find him behind a bar in the basement. He is on his back with his arms tight against his sides, breathing heavily with blood on his face. He feels cold to the touch and his eyes remain half-open. Three members carry him back upstairs and put him on the couch. Over the next 42 minutes members shake him, try to prop up his limp body, cover him with a blanket, wipe his face and try to dress him. 10:35 a.m.: A brother searches on his cellphone for “falling asleep after head injury,” ”cold extremities in drunk person” and related queries. 10:48 a.m.: A brother calls 911, summoning an ambulance. 5:09 p.m.: The fraternity’s president directs a member to get rid of any evidence of alcohol. 1:23 a.m.: Piazza is pronounced dead at Hershey Medical Center. A forensic pathologist said he had suffered a skull fracture, and a shattered spleen accompanied by an abdomen filled with blood. The pathologist said both his head and abdominal injuries would have been very painful. The pathologist also said his spleen injury could have been made worse by jostling, moving him around and sitting on him.